Rising inflation rate in the country threatens to worsen the performance of the Nigerian Stock Exchange (NSE) as more equities investors are likely to switch to fixed income market. The National Bureau of Statistics (NBS) on Tuesday disclosed that the Consumer Price Index (CPI), which measures inflation increased to 11.28 per cent (year-on-year) in September, up from the 11.23 per cent recorded in August. According to the NBS, urban inflation rate increased by 11.70 per cent (year-on-year) in September from 11.67 per cent in August, while rural inflation rate also increased by 10.92 per cent within the review period from 10.84 per cent in the preceding month. While the stock market provides higher returns to investors in the long-term, the risk is higher. On the other hand, fixed income market instruments carry less risk and relatively lower returns. 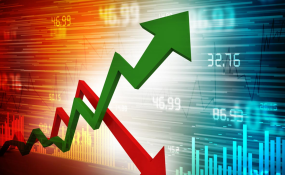 Although the bearish trend in the equities market since February of this year has been attributed to exit of foreign investors, significant numbers of domestic institutional investors and retail investors have also exited the market for fixed income market due to stable returns they get on their investments. Already, the NSE All-Share Index has recorded a year-to-decline of over 15 per cent, while some other sectoral indicators have shed between 11 per cent and 27 per cent. Some individual stocks have depreciated by as much as 60 per cent. However, given the renewed inflation pressure and strong indications that the Central Bank of Nigeria (CBN) could raise interest rate, stockbrokers said exit of more equities investors is imminent. Research analyst at Anchoria Asset Management Limited, Mr. Adedeji Adewole, who spoke in a chat with THISDAY said, "The new trend in inflation will put pressure on the Monetary Policy Committee to increase interest rate and when there is increase in interest rate, the fixed income market will grow and the stock market will be affected negatively. "For now, there will still be quietness in the stock market because of the political risk ahead. So, we don't expect many activities in the capital market. Yes, the market will continue to experience an up and down movement, but there would not be many activities in the market until after election. But the fixed income will be seen as a safe haven for this period until after the election." Analysts at WSTC Securities Limited said they expected the upward trend in the headline inflation to continue in the subsequent months of the year, on the back of election-related spending, bottlenecks around food supply, and rising liquidity in the system on account of the 2018 budget rollouts. "Also, we believe that given the rising crude oil prices and stable oil production, the potential rise in Federation Account Allocation Committee (FAAC) allocations poses a downside risk to inflation," they added. The chief executive of one of the leading stock broking firms who pleaded to remain anonymous said, "With the high level of erosion in value of equities already experienced due to the bear run, a rising inflation is not good for the market because it will mean further reduction in return on investments. This means some investors would prefer where there is a guaranteed fixed return on investments and that is the fixed income market." According to him, the anticipated hike in interest rate would pull more investors away from the equities market.